I’ve been obsessed with the Olympics, as I always am; some of you know I was a better-than-average runner years ago. Ask any athletes whose sport are contested in the Olympics and — if they’re honest — they’ll tell you about that sweet melancholic pang they feel watching the world’s greatest go faster, stronger or higher than they ever did. We dreamed. Olympians do. I never competed in a winter sport, but I’ve been fascinated by biathlon my whole life: Biathlon is the combination of cross-country skiing and target shooting. Americans fared reasonably well in this sport this year, but Europe owns biathlon. As I was watching the biathlon, seeing Swedes battle Norwegians and Germans battle Austrians and Swiss, I was struck by humans’ ability to celebrate both similarities and differences, seemingly without contradiction. Norwegians and Swedes will battle to the death to best their neighbor, as will my people — the Scots and Irish — in warmer sports. I good way to pick a fight is to tell a Swede (or a Scot) that there’s no difference between him and a Norwegian (or an Irishman). But on a grander scale there is far more that is similar between nations like these than there is that is different. And in the Olympics, even seriously disparate nations — like Turkey and Canada in ice skating — revel in the spirit of sharing the same ice or snow trail. I’m not really mad that we lost to the Canadians in hockey; it was a great game no matter who won. Oddly enough, the same holds true in food. Take one of my favorite wild game stews, the classic Hunter’s Stew. You probably know it as cacciatore, usually made with chicken. I mostly make it with pheasant, but the stew can easily be made with rabbit, turkey or any white-meat game bird; partridges would be an excellent choice. A while back I wrote about a classic Italian version of cacciatore, and this year I stumbled upon a luscious version from Chartreuse, in Alpine France. I found the original recipe in the wonderful book Auberge Of The Flowering Hearth, which is part cookbook and part travelogue of this region, which is not far from Italy as the crow flies — of course the crow would need to fly over the Alps to get there. No one really knows the origin of cacciatore, but it is an amalgam of tomatoes (a New World product, by the way), mushrooms, white wine and a white meat. Whether the original was made with pheasant (a Chinese import) or chicken isn’t clear. Nonetheless, Spain, France and Italy all claim this dish, and I am sure gastronomes with nothing better to do argue over this; an argument not quite to the level of an Olympic contest, but still. And the arguments are typical of how we like to separate things — and people — into boxes. Yes, the dish always feels and tastes similar no matter where you eat it, but, like with cassoulet or Bolognese sauce, the fights are over minor differences: Which meat? What kind of mushrooms? What sort of wine? In this French version, the answers are a stewing hen or young rooster, unspecified mushrooms and a combination of Armagnac and vermouth. Chartreuse is apparently a mushroom hunter’s paradise, so I decided to try to get my hands that most French of mushrooms, the chanterelle. Chanterelles are a perfect mushroom for the French hunter’s stew, which is smoother and a little more refined than the Italian version. I prefer porcini in the Italian version, which is pure comfort food. 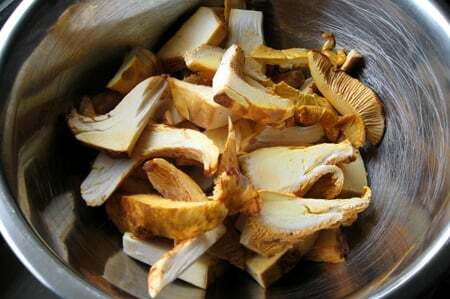 Chanterelles keep their texture well in long cooking, sear well and their pretty golden color and apricot aroma makes them a more sprightly choice than the woodsier porcini. So too with the French version’s Armagnac and vermouth. I had never combined these drinks before in a dish, but I will again — the sweet muskiness of the brandy and the austere edge of vermouth sharpens the crushed tomatoes that form the basis of the stew. Most other versions of hunter’s stew just use white wine. And no French dish would be complete without heavy cream, right? Just a few tablespoons of heavy cream, mixed with corn starch, thicken the stew and turn a slightly cutting flavor into one that is soft and silky. God bless cream. The final refinement is the choice of garnish: chervil instead of parsley. This is genius, because chervil’s lacy leaves just look fancier than parsley, and the faint anise flavor adds a lot — flat-leaved parsley’s clean greenness is fine, but not the same. We loved this dish. It required a special wine, however, so I pulled a bottle of Sierra Vista’s 2000 vintage of its “Fleur de Montagne,” the winery’s Chateauneuf du Pape blend of Syrah, Grenache, Mourvedre and Cinsault. It is a lovely wine, even after a decade in the bottle. It lost a little color, but still had a whisper of fruit and a solid backbone of tannins. Here is the French hunter’s stew recipe, and here’s the classic Italian cacciatore recipe. In the end, they are very different dishes. Yet they are both hunter’s stews, originating just a few hundred miles from each other. Just a few hundred miles apart… kind of like a Swede and a Norwegian, or an Irishman and a Scot. I love Auberge of the F.H.—one of the best for armchair traveling as well as cooking (I like Patience Gray’s Honey from a Weed too.) 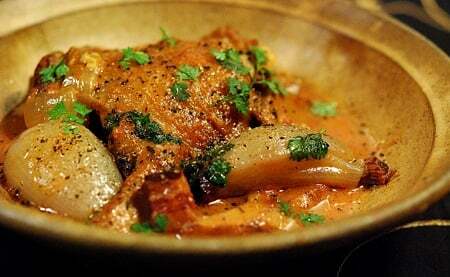 I’d add a Spanish version I’ve made from Penelope Casas for a triumvirate of European chicken stews. I think hers is called Pollo en samfaina and has eggplant and peppers and white wine. And jumping over to the New World, there is a Mexican version of chicken stew/chicken in sauce with crema and tomatoes, although no booze, I don’t think. I’m in your neck of the woods–Winters–and our plum tree was in full bloom before yesterday’s rain and hail. So armagnac is a nice symbol of the season ’round here. Jen: Glad to help – did you get any rabbits? Russell: It’d be worth it to go on the pay-to-play hunt to make this stew. It’s that good! Elizabeth: I love Patience Gray’s book, too. I’ve made Casas’ Spanish hunter’s stew, also, but not the Mexican version. Wniters, huh? That’s right down the road!